The newly-minted Indian mixed doubles pair of Ashwini Ponnappa and Satwiksairaj Rankireddy continue their fine run at the $65, 000 Yonex Dutch Open 2017 after making it through to the semi-finals of this Grand Prix tournament at Almere, Netherlands on Friday. The Indians, who qualified for this event, needed just 32 minutes to dismiss the challenge of the unseeded Irish-Swedish combine of Scott Evans and Amanda Hogstrom, 21-18, 21-14. 170 ranking places separate the 129th ranked Indians from the 299th ranked Evans and Hogstrom and the gulf in the rankings was evident as the Indians simply elevated their level in the second game after a close opening game. Ponnappa and Rankireddy next meet the eighth seeded English combine of Marcus Ellis and Lauren Smith for a place in the final. 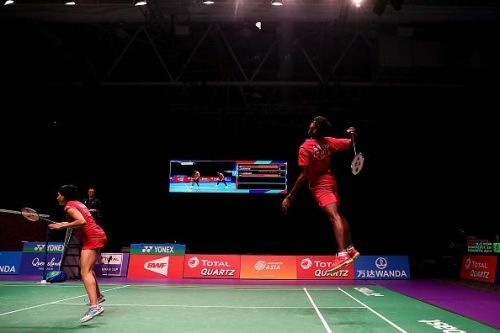 No Indian shuttler has reached the final of any Grand Prix tournament this year and Ponnappa and Rankireddy are attempting to become the first ones. They have put up some confident display throughout the week and began their main draw campaign with an upset win over the seventh seeds Robin Tabeling and Cheryl Seinen in the first round. Rankireddy and Ponnappa, who played sporadically in the first half of 2017, formed a regular partnership after the World Championships in August. This is their third tournament in a row after the Korea Open and the Japan Open Superseries events last month. Showing steady progress, the pair first qualified for the Korea Open and then took it a step further by winning their main draw first round as well the next week at the Japan Open. Other than Ponnappa and Rankireddy, no Indian has managed to make a deep run at this tournament. While Rankireddy excelled in mixed doubles, he did not have the same fortunes in men’s doubles. He and Chirag Shetty went down 17-21, 14-21 to the fifth seeds Liao Min Chun and Cheng Heng Su in the first round. In men’s singles, the 15th seeded Subhankar Dey had raised hopes of an upset after he went a game up over the fifth seed Emil Holst. But the Dane came storming back to edge the Indian in a close second game and pull off a 14-21, 22-20, 21-11 win in the third round.